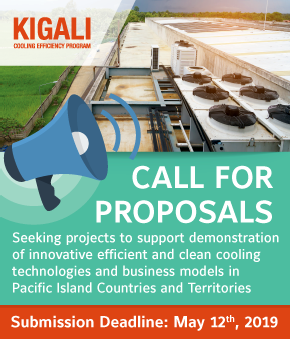 The Demonstration of Innovative Technology and Business Models for Efficient and Clean Cooling in the Pacific project (Cooling Demo Project), funded by the Kigali Cooling Efficiency Program (K-CEP) is seeking high quality proposals to support demonstration of innovative efficient and clean cooling technologies and business models in the Pacific Island Countries and Territories (PICTs). Such demonstrations must include actual installation and operation of efficient and clean cooling technologies, or adoption of business models, and meet the requirements outlined in this Guideline. The Cooling Demo Project provides financial support and technical assistance to these demonstrations to mitigate barriers pertaining to initial investment costs and knowledge which constraint greater adoption of efficient and clean cooling in the Pacific. Proposals for grant and technical assistance for Cooling Demo Projects are due on Tuesday, April 30th, 2019, by 6pm, U.S. Pacific time (GMT -7). IIEC may issue another call for proposals after reviewing the submitted proposals depending on various factors including the number and strength of proposed demonstration activities. Government agencies, authorities, private companies and NGOs are eligible to apply for the financial and technical assistance available from the Cooling Demo Project. Applicants can partner with other organizations to meet human resource requirements, technical capacity and financial capacity to implement the proposed project. The applicant, or one of the applicant’s partners, must have a registered office in one of PICTs. Collaboration among PICTs and between PICTs and other countries is considered as the key advantage of the proposal. Note that an applicant can be a lead applicant in only one (1) proposal, however a lead applicant of one proposal can also join an unlimited number of other proposals as a partner. If an applicant submits more than one proposal as a lead applicant, all proposals submitted by this applicant will be disqualified. The Cooling Demo Project will focus on installation, commissioning and operation of innovative efficient and clean cooling technologies, as well as adoption of business models that facilitate the use of such technology. The proposed demonstration should help enhance local knowledge and experience, prove the cost effectiveness of these technologies in saving energy and operating costs, help inform policy, financing and other supporting mechanisms to address market barriers (e.g. policy, regulatory, financing, capacity) and subsequently drive market demand which would in turn result in the creation of new efficient and clean cooling businesses and employment opportunities. The proposed demonstration must be implemented in any one of the following 22 PICTs: American Samoa, the Cook Islands, the Federated States of Micronesia, Fiji, French Polynesia, Guam, Kiribati, the Republic of Marshall Islands, Nauru, New Caledonia, Niue, the Northern Mariana Islands, Palau, Papua New Guinea, the Pitcairn Islands, Samoa, Solomon Islands, Tokelau, Tonga, Tuvalu, Vanuatu, and Wallis and Futuna. Applicants shall inform the national Energy Efficiency and Ozone Units in the respective target countries of implementation about their intention to demonstrate of innovative efficient and clean cooling technologies. Endorsement by the national Energy Efficiency and Ozone Units in writing can be submitted after the pre-screening process of the initial application form. Cooling and refrigeration products/systems for residential, government commercial and industrial facilities. The above innovative cooling and refrigeration products / systems can either be powered by grid-electricity or stand-alone renewable energy systems or a combination of both. In case a refrigerant-based cooling/refrigeration product/system is proposed, the refrigerant shall be zero or reduced Global warming potential (GWP) refrigerant. A list of some potential innovative efficient and clean cooling technologies is available on the Cooling Demo Project website (http://iiec.org/coolingdemo-innovative-technologies). The Cooling Demo Project has no specific technical focus for a specific PICT, however applicants must ensure that the proposed demonstrations do not duplicate existing efforts already supported by other donor/international development agencies, but rather generate synergies with the existing ones. The implementation period for demonstration activities shall be from 1st June 2019 and completed before 30th June 2020. Benefits for livelihoods and employment. K-CEP has provided up to USD 100,000 to support demonstration of efficient and clean cooling technologies in the Pacific, and, under this available funding, the Cooling Demo Project provides grants and technical assistance to successful applicants in the demonstration of innovative efficient and clean cooling technologies or business models. The maximum grant support per demonstration project is USD 20,000. In case, multiple demonstration projects are implemented in a specific country, the total grant support for all demonstration projects in one country shall not exceed USD 20,000. Applicants shall justify the need for the requested grant and technical assistance and describe how the grant will contribute to the successful implementation of demonstration activities. Applicants shall demonstrate their in-kind or cash contribution (in USD equivalent) to implementation of the demonstration projects. This is considered as one of the key requirements for eligibility for the project grant support. There is no minimum requirement of the share of co-financing in the total cost of a demonstration project. The proposals shall include all relevant information about the demonstration activities and tentative work plan and applicants’ background supported with relevant references (e.g. 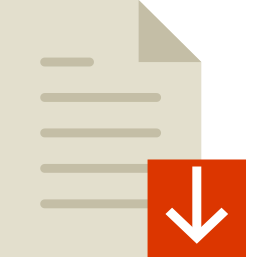 technical specifications of innovative efficient and clean cooling technologies or descriptions of business models, letter to the government). Submitted proposals will be pre-screened for completeness and basic eligibility. 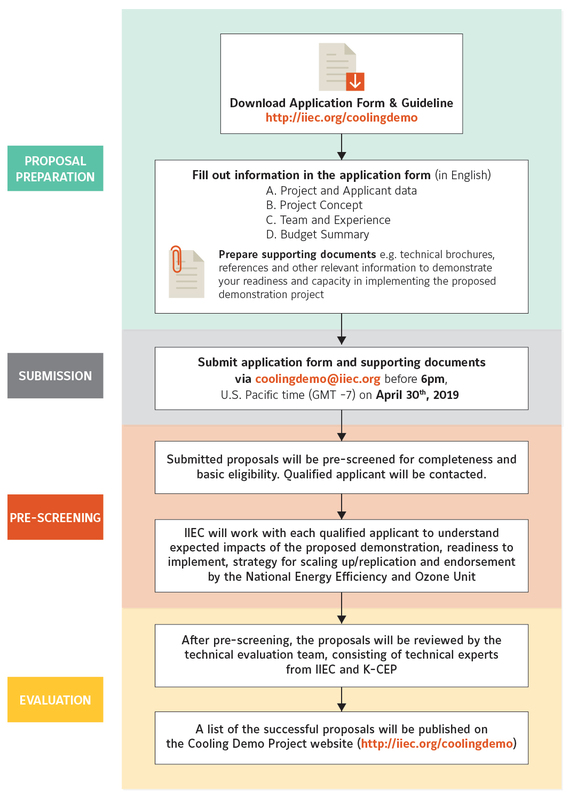 After the pre-screening process, IIEC will work with each qualified applicant to understand expected impacts of the proposed demonstration, readiness to implement, strategy for scaling up/replication and endorsement by the National Energy Efficiency and Ozone Unit. Once all information and supporting documents are completed, the proposals will be reviewed by the technical evaluation team. Figure 1 shows the steps to submit a proposal.